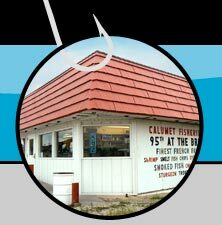 65 Years later, Calumet Fisheries is still run by the Kotlick-Toll family. Our loyal staff is part of the family, too. And we're still serving the freshest, most delicious fish around – served with a side of South Side history! Now, like then, we are strictly a take-out business. Sorry, no seating, no bathrooms. Many of our customers enjoy their smoked and fried seafood right away - in their cars parked out front.